AMES, Iowa — A team of Iowa State University architecture students has won the National Concrete Masonry Association (NCMA) Education and Research Foundation Unit Design Competition to design a new concrete masonry or hardscape unit that can be mass-produced on a block or big-board machine. Iowa State’s team was one of eight selected from regional competitions to advance to the national competition and one of only three invited to present their projects to judges in August at the NCMA’s mid-year meeting in Toronto. Nathaniel Jones, Bloomington, Illinois; Colleen De Matta, Coralville; and Ayla Hendrickson, Colorado Springs, Colorado, developed their winning project, “Amphi-Block,” as third-year students in the spring 2017 Building Science and Technology IV class taught by Bo-Suk Hur, ISU lecturer in architecture. The students were asked to take existing industry guidelines and develop a single block, or a series of blocks, that could be used in architectural and landscape applications. The assignment challenged students to work on a much smaller scale than they are accustomed to, Jones said. “For this project to focus specifically on a mold in which four concrete masonry typologies needed to be produced and assembled was a change of pace,” he said. 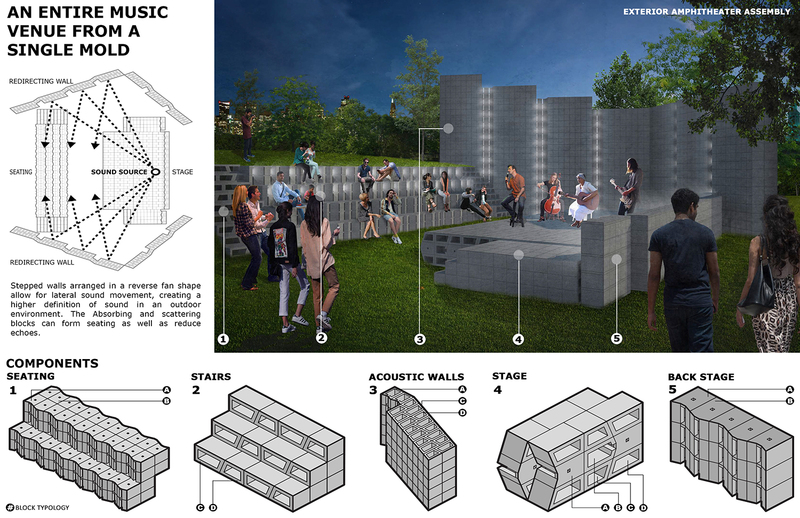 The Iowa State team chose to design an acoustical block for indoor and outdoor theater applications. “Spaces of high sound quality, such as musical practice rooms and theaters, typically rely on expensive materials and complicated spatial arrangements,” Jones said. The team aimed to design versatile, affordable, effective and efficient assemblies “that would make the practice and experience of live performance easily attainable,” De Matta said. The students adjusted their proposed block’s angles and openings and tested different configurations to meet standards for sound absorption/noise reduction. This resulted in a unit of four blocks that could be manufactured in a single mold, then assembled in nearly infinite combinations for various acoustical and spatial contexts. Two blocks focus on absorbing and scattering sound, while the other two blocks direct and amplify sound off their singular angled faces. Hollow spaces in the blocks can be fitted with sound-absorbing foam as well as electrical and lighting equipment. The blocks also can be arranged to create seating, a stage or stairs. An entire theater could be built using one block mold. Last spring, the team won a regional unit design competition sponsored by the Masonry Institute of Iowa, King’s Material and Midland Concrete Products, which qualified them for the national competition. A new component of the national contest this year involved the selection of three top teams to present their work in person to judges at the NCMA meeting and an opportunity for meeting participants to vote on the best presentation. The ISU students believe the quality of their presentation is what set them apart in the competition. “Bo-Suk’s constructive feedback and experience with competitions was immensely helpful,” said Jones. “He helped us create the best possible visual aids” and ensured the presentation could compete at that level, Hendrickson added. The competition also provided the team with invaluable experience as a part of their education, De Matta said. 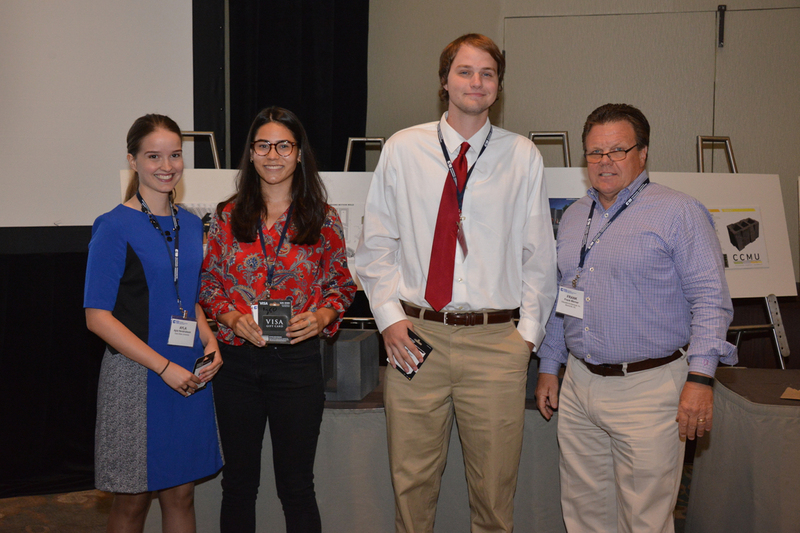 “It gave us the opportunity to see how passionate everyone at the conference was about building materials, and become acquainted with a profession that we will cross paths with in our future careers,” she said. This is the first time Iowa State has won the national competition. An ISU team placed second in 2015. The first-place team received $250 in prize money for both regional and national wins.